When we play with traps in the game we often designate some brave soul as the door opener and therefore the trap magnet. The reason being that the same trap doesn’t stack so rather than 3 people not able to talk with one hand on their head we have one poor soul who is severely hampered but able to open new rooms while the rest of the party is unlocking gems. The only trap this person should worry about is the one that makes you lose a dice as he will need all his dice to keep up with the party. Other people in the same room can still give him gold dice to keep him running at full capacity. One of the worst fates that can befall an adventurer in Escape: The Curse of the Temple is to be stuck with all black masks, requiring either adding a gem to the gem depot, or hoping a teammate will be able to help them remove their curses. Since the possibility of sitting still doing nothing is so crippling, I’ve found it helps greatly to keep a gold mask in reserve when possible. On rolls where you have no black masks and roll a gold mask, keep the gold mask set aside until you have one or two black masks to cancel it with. While this will generally reduce the total dice that you’re actively rolling by one, it will immediately cancel black mask rolls and give you more flexibility. In addition, if you’re working in pairs and communicating well, you can immediately share the gold mask with your partner if they ever roll a black mask. In this way, a group of 2 is only reserving 1 of 10 dice, as opposed to a single player’s reserving being 1 of 5. The title pretty much sums it up, while playing last night with a couple friends we found an amazing trick that will shave at least a full minute off your time. When you are rolling to try and match symbols for gems or to decurse your friends or even lift a curse you often will roll 2 green running men. Your mind is so focused on rolling the key or torch that you need that people often miss the double green and scoop all their dice up. Use your 2 green running men to place new tiles this will stop you from rolling to reveal tiles all game long. In Escape: The Curse of the Temple, your team needs to activate as many gems as you can before the time runs out. In games with 4 or 5 players, it helps greatly to split into two teams, with the teams going different directions. The 2/3 people in a given team should attempt to stay, for the most part, together (generally within a room of each other). Playing in this way increases the speed in which you can get through tile stack as you’re attacking it in two directions. Additionally, you always have a teammate to help with sharing gold masks. Two people can generally successfully get to the 7 needed dice to get 2 gems from the gem chambers. Playing in 2 player teams will reduce the liklihood of getting to the 10 needed dice (though it’s still certainly possible) for 3 gems in the gem chambers. This means you’ll typically want to focus on getting at least 2 gems in these chambers, as a single gem will be difficult to make up for later. Often, this will lead to one of the two teams finding the exit before the 2nd return to the central chamber, making it easy to keep the entire team together for the final escape. In larger groups, grab a friend, stick with them, and you’ll have a much better chance of clearing out the gem depot, and escaping successfully. 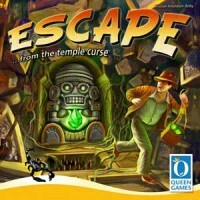 Speed is key in Escape: The Curse of the Temple. Quick decision making and focused goals will go a long way towards success. To give yourself the most rolls and best chance to win, control your dice when rolling. While it sounds obvious, watching groups play the game will show there’s often at least one person that rolls their dice all over the table, with a lot of waiting for dice to stop rolling and spinning. Time where you are waiting for a result, or needing to reach across or under the table to grab rogue dice is time you’re not advancing through the temple. Aim to pick a small area in front of you, away from the expanding board and the edge of the table, and keep your rolls short and quick. Pull any dice you are saving off to the side to keep the dice you’re actively rolling from colliding with them, knocking them around costing more time. With a game that only gives you 10 minutes, and sprints back to the central room often are achieved with seconds to go, buying yourself extra time by controlling your dice rolling can give you the few extra moments you need to escape.